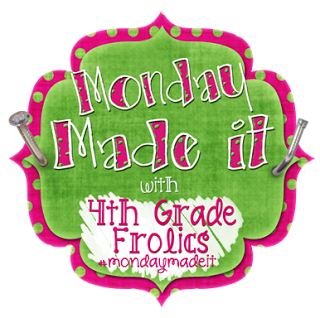 Here I am linking up with 4th grade frolics for another Monday Made it! I had a few little projects that I finished up this week, but I really need to get going as we only have two weeks left until teachers go back! We are allowed back into our rooms next Monday, so I really want to be as close to 100% done with everything at home before then as possible. I am going to be so busy! I found these magnetic stands at Joann Fabrics on clearance for $5.00, and I knew they would be perfect for something! 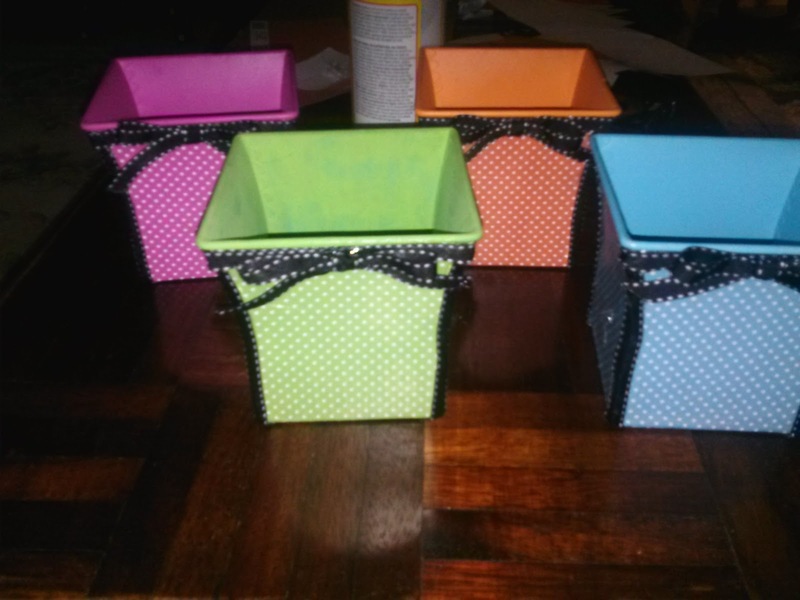 I added the ribbon around the edges and some circle stickers all over for polka dots. Much better than plain old pink and green! I am planning on using one for my guided reading targets and the other at my listening center for the procedures/listening center target. 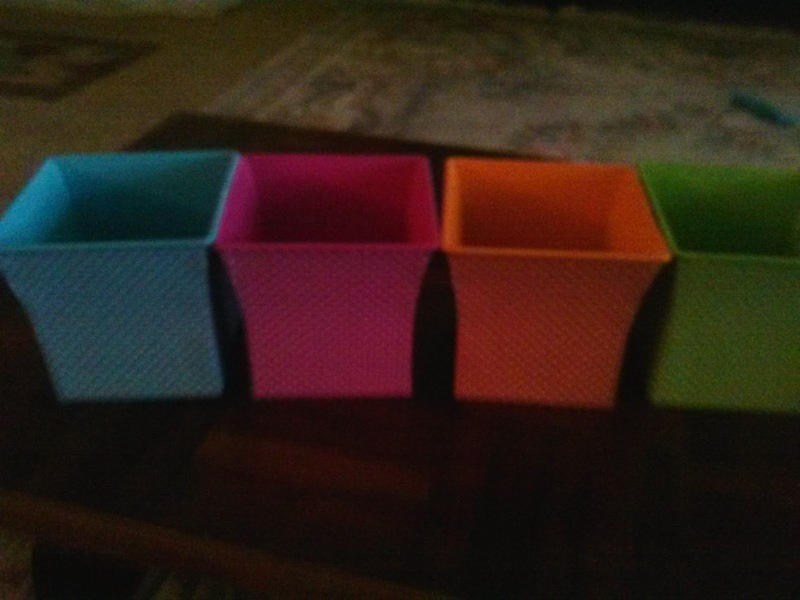 I got these accordion folders at the Target $1 spot a few weeks ago (to use for word wall cards and task cards), but have been looking for the right containers to keep them in. I found some old show boxes in my closet, covered them with scrapbook paper, added the ribbon to cover my bad mod podge cornering skills (and make them look cuter!) and voila! 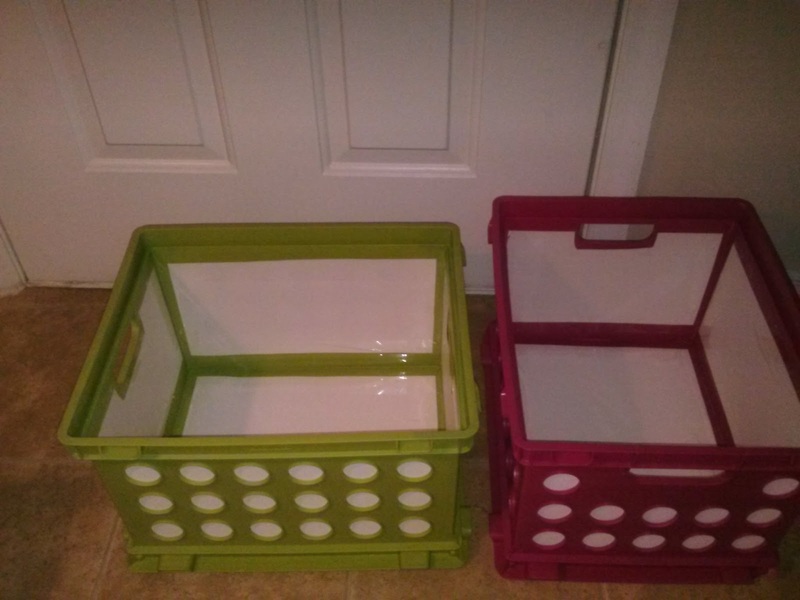 My new matching storage! I have been working on some new décor for my classroom on the computer this week. 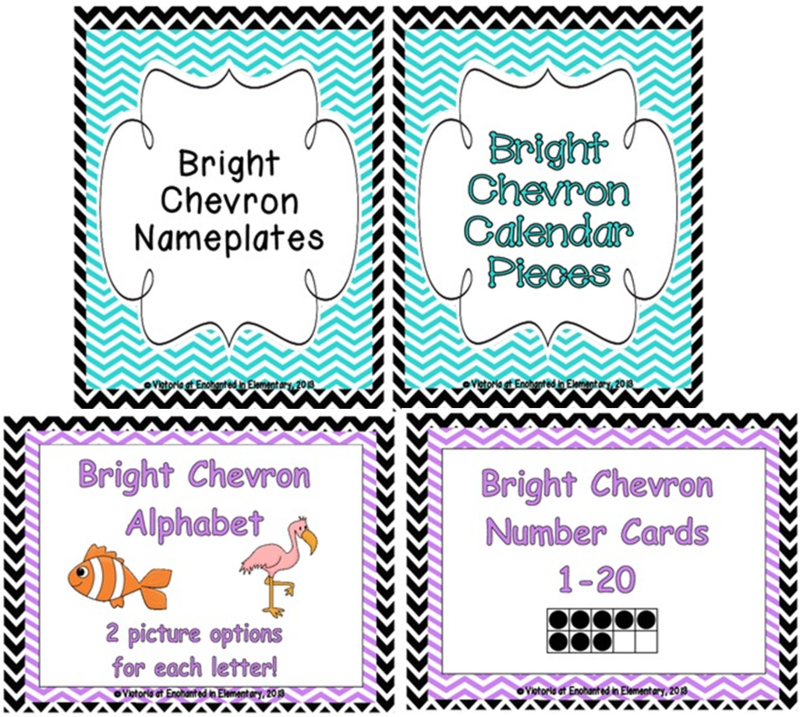 I made myself a new alphabet, number cards, nameplates, calendar pieces and more! 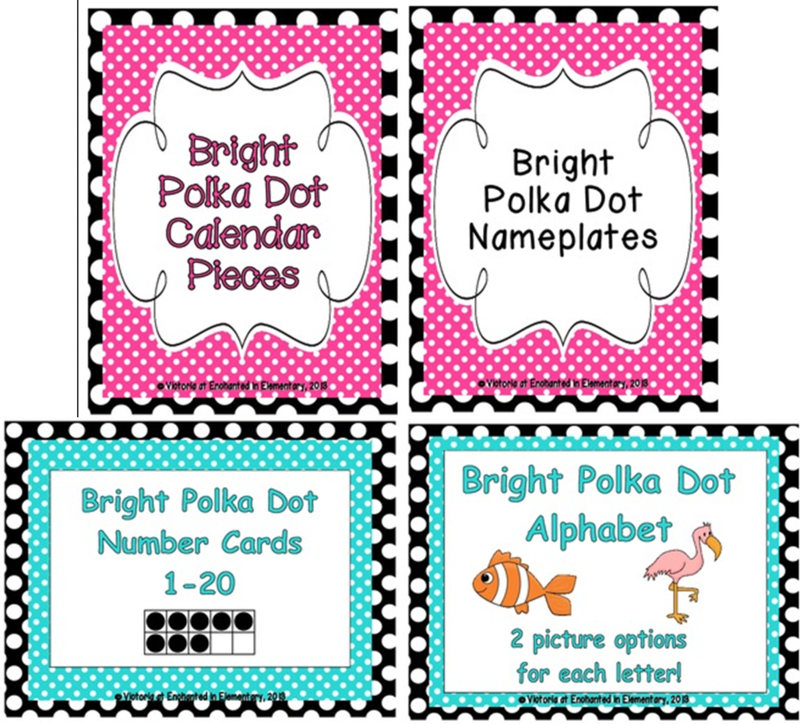 I use a variation of the Bright Polka Dots sets in my room, but decided to make a few different options, including chevron in bright and primary, and polka dot in primary. They are all available in my TPT store! Well that's it for me! Thanks for reading and let me know what you think! 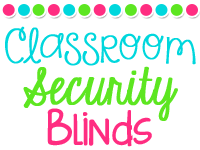 Monday (Mom) Made It - Crate seats, seat sacks, and classroom security blinds! 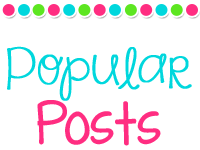 I'm linking up with Fourth Grade Frolics for another Monday Made it! This time I'm doing something a little bit different. Today I'm going to talk about some projects that my Mom was kind enough to do for my new classroom! She is very creative, talented at sewing, and always willing to help out! 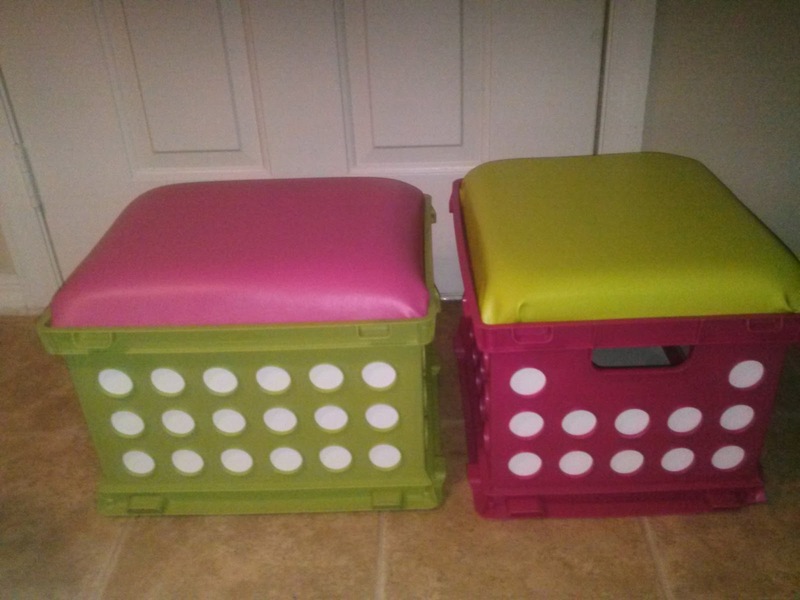 I'm not going to go into too much detail here, as there are lots of tutorials for making crate seats. There are a couple of things we did differently though. We used a naugahyde material for the seat covers instead of a cotton print. Although I know that little polka dot seats would have been adorable, I love the simplicity of these and the fact that the seat covers are very easy to clean! Just wipe with a wet cloth and presto, clean! I also added the white posterboard inside so that I can use them for storage without everyone seeing my mess highly organized storage space! 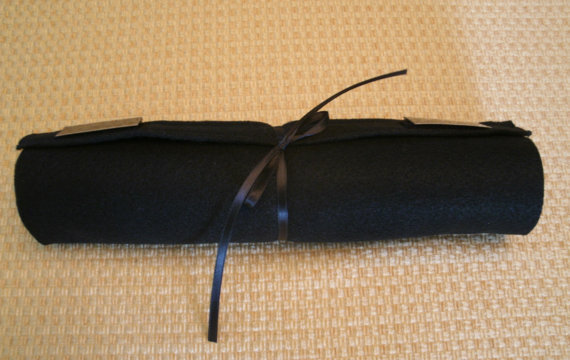 When I first started at this school I was given a class set of seat sacks. They were a lifesaver! I didn't have very much storage in the classroom, so they allowed the kids to keep more materials at their seats without having desks overflowing. I cannot say enough good things about seat sacks! Unfortunately, they were primary blue (which does not go with my colors in the slightest!) and pretty torn up/gross looking by the end of the second year. I looked into buying a new set, but they are pretty expensive! Luckily my Mom volunteered to (attempt to) make me some. She tried a couple of different materials before deciding on duck cloth. Naturally she added some bright pink, green and white accents! I am so in love with these! As much as I love my crate seats and my seat sacks, I love this last project even more! 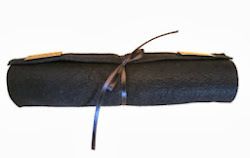 My Mom was volunteering in my room last year and saw black paper rolled up above the window on the front door. When I told her that we use it to cover our windows in case of a lockdown she came up with a better idea! Her blind attaches above the window with Velcro, so it is easy to remove. I love that all I have to do is pull the ribbon and the blind drops and instantly covers the window. I don't have to stand in front of the window in plain sight and waste precious time taping down black paper. She made it flame retardant so that it meets our district's standards for use of fabric in the classroom and it is made with felt so that you can see shape and movement outside if the lights are off in the room, but no one can see in. Well, that's it for my (mom's) Monday Made it! Thanks for reading and let me know what you think! 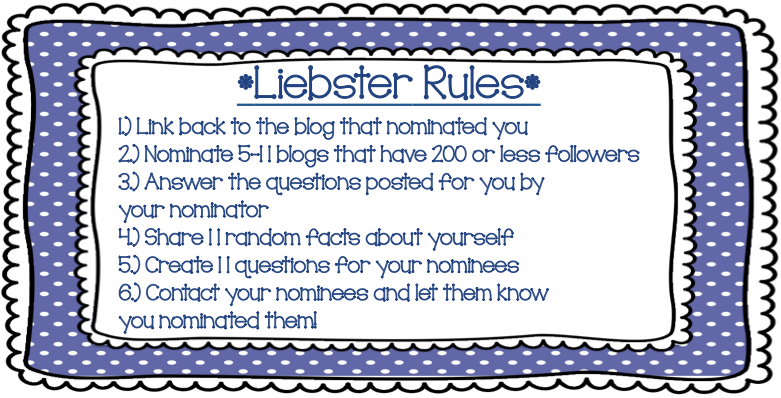 was kind enough to nominate me for the Liebster Award! It is much appreciated and I am happy to pass the nominations on! 1. Where did you go to college? How was it? I went to Florida State University in Tallahassee. I really liked the small town feel of Tallahassee and loved the old red brick look of the campus. It has a lot of very pretty walking paths with big trees overhead. 2. What is your favorite movie and why? I am a bit torn here. There are a couple of favorites I could pick! I think I will have to go with Love Actually. I watch it any time I have to stay home sick. I love all of the different storylines and how they are all connected. It’s a must-watch if you haven’t seen it yet! 3. If you could go on a shopping spree, where would you go and why? I would probably have to pick Barnes & Noble. I have always loved to read and could always use extra books for both the home and classroom libraries! 4. If you could visit anywhere in the United States, where would you go and why? I would go to Wisconsin. I have a lot of family there and I always enjoy visiting, especially when it is cold and snowing! 5. Where do you teach and what makes it awesome? I teach at an elementary school in Florida. We are one of the biggest elementary schools in the district and have a great faculty and staff. Everyone is friendly and it is a very welcoming environment. 6. Name two things that makes your job awesome. I love seeing the kids get excited about learning. Everything is new and exciting, it's great to see. I also love to see how far my students come in a year's time. It's always great to look at their portfolios and see how hard they have worked and how they have grown. 7. Name two things that make your job (at times) frustrating and difficult. I have been an add-on class for the last two years, so I don't always end up with the same supplies as the other classes. It can be a bit frustrating, but people are usually willing to share and I have ended up making some resources that I will use for years to come. I have also been in a portable classroom for the last two years. I've been very happy to have my own classroom, but sometimes the size made things a challenge! My projector was on a rolling cart, so whenever I used my Mimio interactive whiteboard it needed to be recalibrated, sometimes several times during a lesson if someone was moving around! 8. Do you have any pets? Tell me about them. If not, what pet would you have if you had to choose? I have a cat named Maggie. She is eight years old and a very shy girl. I adopted her when I went off to college and she has been a great companion ever since. 9. What is your favorite recipe? My mom makes the most amazing bacon-wrapped chicken with a cream cheese and mushroom sauce! We have it every year on Christmas Eve (and only on Christmas Eve as it is pretty up there in calories!). Everyone looks forward to it! 10. If you weren't an amazing teacher, what job would you choose? I would want a job where I can create something. I used to be a floral designer when I was in college and would probably choose to do that again if I didn’t love teaching so much! I absolutely love root beer! Regular, diet, doesn't matter! 12. Bonus Question: What is your favorite thing to do during the summer? Teaching related- I like to make some of those classroom projects I’ve been pinning all year! Non-teaching related- I like to get big stacks of books from the library and read during all of our Summer rainstorms. There have been a ton this Summer so I’ve gotten quite a bit of reading done! 1. I have had the same part time job since I was a junior in high school! I work in retail and have been fortunate enough to be able to transfer stores whenever I have moved to a new city. During the school year I just work one evening, but during the Summer I work the 5 a.m. shifts! It's a good way to make some extra cash and I enjoy the work, especially setting planograms. 2. I love to knit and cross-stitch. One Christmas I knitted or cross-stitched gifts for my for my whole family. It took forever and I don't think I will ever be able to find the time to do it again! 3. I love Irish dance! I have been to see Lord of the Dance five times and could definitely go again if the show comes back to town! 5. I used to play the violin in middle school. I was in the school orchestra and competed in a few competitions. 6. I am originally from England. My family moved here when I was four and I have been back to visit once in high school. I would love to go again! 7. I have a terrible fear of spiders! Unfortunately something about my first car seemed to attract them, there was always one crawling across the windshield or dangling from the ceiling as I was driving. I drove in a constant state of paranoia for years! 8. For my first year of teaching I drove 40 miles each way to school! I started in April at a school in a different city and had to drive along this one-lane road in the dark. There were no streetlights and people were always right up on your bumper. I am a bit of a nervous driver anyway (I blame it on the spiders!) so it was a very uncomfortable trip every morning! Luckily I was transferred to a different school that is very close by. 9. I used to be a floral designer. I really loved designing while I was in high school and college. I still love to make arrangements, but my favorite will always be bow-making! I am always trying to find things to add bows to in the classroom! 10. I have a very clever cat! Maggie can do tricks on command. She can sit, stand, shake my hand, jump up or down, and speak. We are working on "heel," but she doesn't seem to like that one very much! 11. I love Jane Austen! I have read Mansfield Park and Pride and Prejudice more times than I can count and am always willing to read either one again. 1. If you could pick any grade level/subject to teach, what would it be and why? 2. What is your favorite book and why? 3. What is one food you couldn't live without? 4. If you could visit any foreign country, which would you pick? 5. 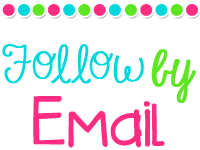 What is the best piece of teaching advice you have received? 6.If you could trade lives with anyone for a day, who would it be? 7. What is one thing on your Summer to-do list that you haven't gotten around to yet? 8. What is one TV show that you never miss? 9. When you were in elementary school, what did you want to be when you grew up? 10. You just found $100 in an old coat pocket, what do you spend it on? 11. If you could choose to win any award (Oscar, Grammy, Olympic medal, etc. ), what would it be for? As of today there are only four weeks until teachers go back to school here! I am getting a bit concerned as my to-do list seems to keep growing, even as I finish projects! and loved it! I think we will use it mainly when we read chapter books. I'll have the kids write down predictions for what will happen in the next chapter and we will pick a few to read before we read the next day. I also worked on my READ signs for the library. The area where I want to put my library has two large windows into the pod my room shares with three other classrooms. I wanted to put the READ signs on one of the windows, and my favorite character paintings on the other window. I don't have the paintings I did last year to show right now, I'll post them when I can get back into the classroom. For the READ signs: I painted the letters and the plaques, covered the face of the plaques with scrapbook paper, and added the polka dots and ribbon. That's it for me today! I have a few big projects I am working on this week and am hoping they will be done in time for next Monday. As always, thanks for reading and let me know what you think! I have been very busy this weekend crafting for the classroom, so here are my additions to Monday Made It! My student mailboxes from last year needed a lot of help. When I went to move them to the new classroom in June the whole thing fell apart! I managed to put it back together and decided that while I was at it, I would make it match the rest of the room. 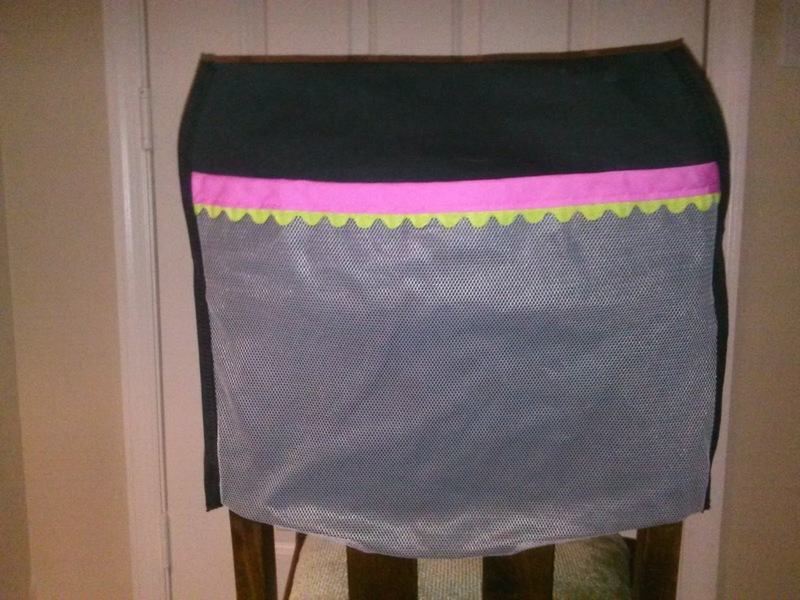 I briefly considered using scrapbook paper to cover it, but then realized what an undertaking that would be and decided to go for duck tape instead. I have seen people using the binder clips for student’s names all over pinterest and love the idea, so I did that too! I painted the whole thing black, added the scrapbook paper circles and printed B on top, and punched out some dots from the scrapbook paper for the little polka dots. 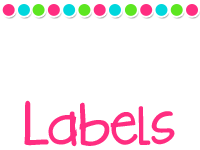 The larger polka dots are the circle labels they sell in the office section of most stores. They worked perfectly! And last, but not least, are my rules. I have a bulletin board above the computers in my new room so I wanted a display that I wouldn’t have to be climbing over computers to change all the time. 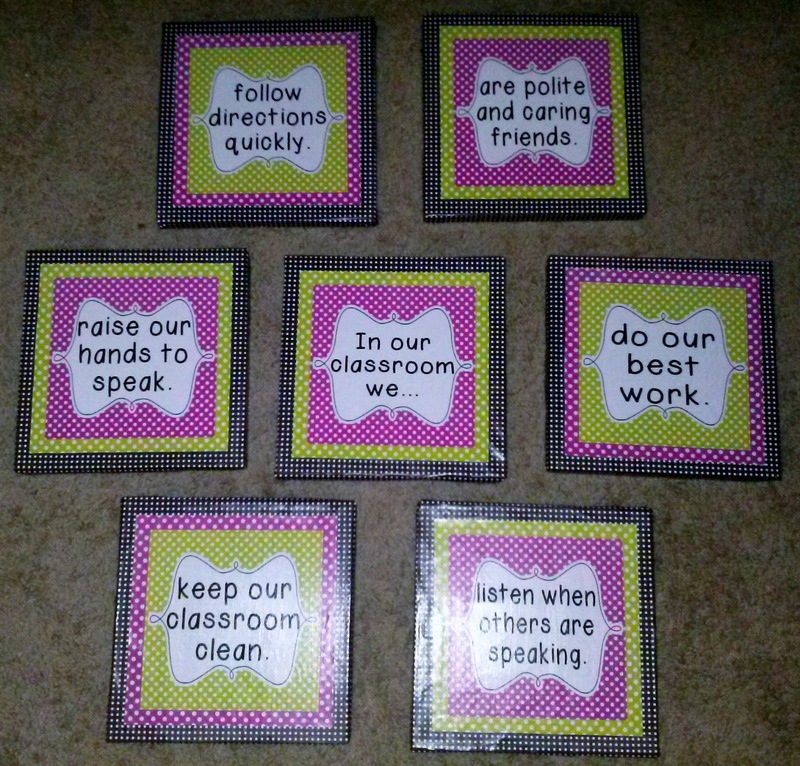 I figured it would be the perfect place to display the classroom rules. I wanted something that popped a bit more than just printed paper. I got some 8x8 canvases and wrapped them with scrapbook paper and mod podge, then mod podged the rules on top. One thing to keep in mind is that anything printed on an inkjet printer will bleed when you use mod podge unless you seal it first. There are a number of different ways to do this if you look it up, but I had these printed at Staples to avoid that bother! Thanks for checking out my second Monday Made it! Let me know what you think! 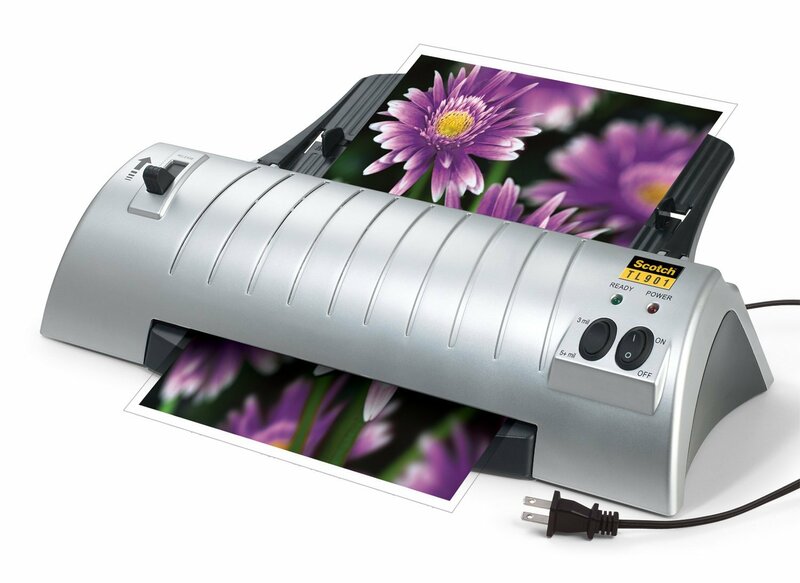 If there is one classroom purchase I love above all others it is my new laminator! I saw them at Walmart for $25.97 with packs of 50 pouches for around $10 and wanted to see if I could find them a little bit more reasonably online. Well Amazon, you came through for me again! I got the laminator and a pack of 100 8.5x11 pouches for about $40! The pouches are thicker than the laminating rolls we use at school, so everything comes out sturdier. I could not be happier with it! 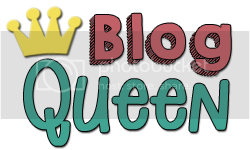 I am linking up with Fourth Grade Frolics for my first Made it Monday! Since I have so much more space in my new classroom, I will be putting a bookshelf with each of my clusters of student desks. I wanted some kind of sign for each table and this is what I finally decided on. 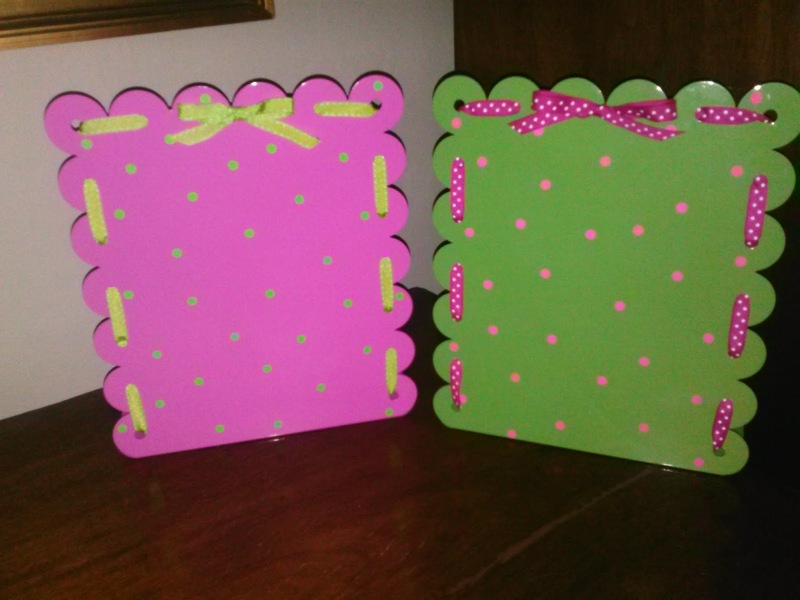 I covered them with polka dot scrapbook paper and added the ribbon at the corners and top. I would love to say that the ribbon was purely for decoration, but let’s face it, there is very little that I struggle with more than getting paper to go over corners nicely with mod podge! I think the ribbon hides all of the little imperfections nicely. Then I added some styrofoam and moss and arranged the flowers, leaving a gap in the top for the sign. I designed the sign on the computer and used my fancy new laminator (Did I mention that I love it?) to make them sturdier. I attached the signs to thin dowels and stuck them in the pots. I really like how they turned out and can’t wait to see them in the new room!